Triceps tendinopathy or triceps tendonitis is inflammation or degeneration of the triceps tendon where it inserts into the back of the elbow. Symptoms include pain and tenderness at the back of the elbow which is usually caused by overuse. 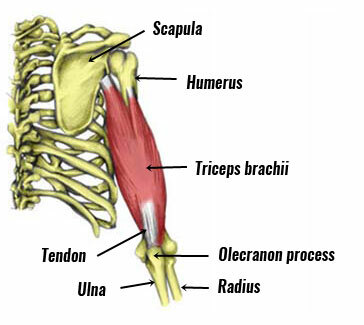 Symptoms of triceps tendinopathy include pain at the back of the elbow which is felt both at rest and during exercise. The back of the elbow will be tender to touch and the patient may have limited mobility and reduced strength. Straightening the elbow against resistance, for example when performing a simple press up exercise is likely to be painful. 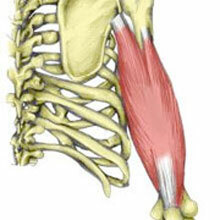 Stretching the tricep muscles may also cause pain or discomfort. The triceps muscle or triceps brachii to use its full name originates at the shoulder (humerus bone and scapula bone) and inserts into the back of the elbow at the prominent bony protrusion on the Ulna bone (forearm) called the Olecranon process. Injury to the triceps tendon can occur from a sudden impact or fall causing a strain (tear) of the tendon, or pain can develop gradually over time through repetitive strain. A common cause when performing overhead triceps extension strengthening exercises in the gym is to use a weight that is too heavy or allow the elbow to go past 90 degrees of bend which forces the muscle to work much harder. Sometimes a tendon strain can occur which is not noticed at the time of injury. It is only afterward or the following day that pain and stiffness are noticed. Failure to treat a tendon strain properly could lead to a long term chronic injury which is more difficult to treat. The term tendonitis refers to acute inflammation of the tendon (triceps tendon inflammation). This will occur in the first few days following injury. However, more long term injuries are more likely to have passed the ‘inflammation’ stage and the term tendinopathy is probably more accurate as this describes degeneration of the tendon rather than the presence of acute inflammation. 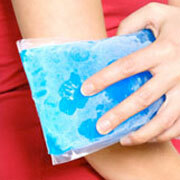 Rest and apply ice or cold therapy to the injury in the first two days to reduce pain and inflammation. Ice can be applied for 10 minutes every hour initially reducing frequency to two or three times a day as symptoms allow. Do not apply ice directly to the skin as it may cause ice burns, but wrap the ice in a wet tea towel or use a commercially available cold therapy wrap. Continue to rest until normal daily activities are pain-free. A professional therapist may use ultrasound or laser treatment to help reduce pain and inflammation. A doctor may prescribe anti-inflammatory medication such as ibuprofen, which may be effective in the short term for acute inflammation, however, it is likely to be less effective over the longer term with more chronic injuries. They may X-ray the elbow to rule out and avulsion fracture which is a strain of the tendon where the tendon tears, pulling a small piece of bone away with it. Later in the healing process after the acute stage has passed applying heat and wearing a heat retainer is likely to be more beneficial. Sports massage may also help the scar tissue heal in a more desirable way. When pain allows, gently stretch the triceps muscle. Bend the arm above the head and use the free arm to pull down increasing the stretch on the triceps muscle. Hold the stretch for 10 to 15 seconds then relax, repeat three times and aim to stretch every few hours throughout the day. The aim of strengthening exercises is to gradually increase the load through the tendon to a point where normal training can resume. Because this is an overuse injury it is better to air on the side of caution and start at a very low level with strengthening exercises. If exercises are painful either during, after, or the following day then take a step back and rest for a while before building up slowly again. The athlete positions the resistance band under the feet leaving an equal length of band for each hand. The athlete straightens both arms above the head. Keeping the elbows pointed upward, the forearms are lowered until a stretch in the tricep is felt. The arms are then straightened again. Be careful taking the elbow further than 90-degrees particularly in the early stages as this significantly increases the forces through the tendon. A tricep dip is a commonly performed exercise. Adding a Swiss ball makes it more challenging for both the arms and the core muscles. The athlete positions themselves with their back to the ball, knees bent and feet on the floor with the hands on the ball, fingers pointing towards their back as shown. The elbows are then bent, to lower the bottom towards the floor. The athlete then pushes back up before repeating.